Whoo-hooo! It’s official, colouring is now one of the coolest things to do! 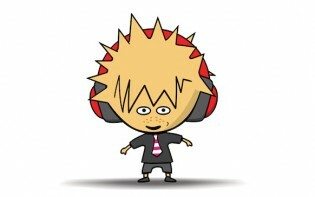 And it’s us kids who are filling our lives with technicolour pages along with adults are doing it too – and it appears that they’re loving it as much as we do. Check out the bookshelves of your local supermarket, there’s best seller reading books and colouring books for kids of all ages, right? Now move along to the adults section of books, it’s bursting with cookery books, novels and ….yes, colouring books. Grown ups all over the country have found the joy of colouring and they’re now filling, scribbling and doodling during every spare moment they are able to. Last week at school, my form teacher gave us all a page of an adult dot-to-dot, with over five-thousand numbers on it; dot-to-dot for adults we all thought. 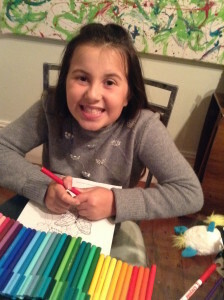 She then went onto explain that her best friend does one of these every day, plus a detailed colouring page every day. And she LOVES it. I’m always hoping that my mum will have spare time to sit down and do some colouring with me, it’s so much fun when she does, and we chitter-chatter away about so many different things whilst we’re colouring. 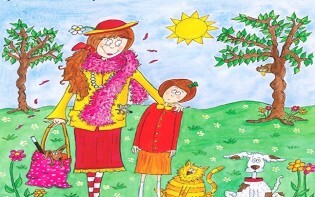 However it’s always been MY colouring book which she uses, she’s far from had one of her own. So what’s made adults suddenly realise that colouring is a great hobby? Why do they now have their own books, it got me thinking so I did a bit of research….. 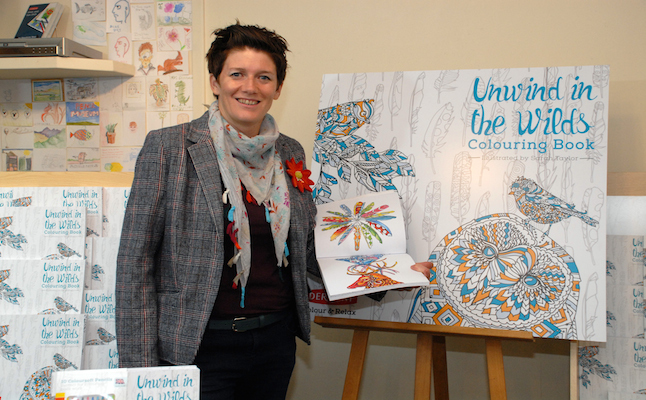 It seems that the trend for adult colouring books has been fuelled by social media. Expert colourists post their elaborate creations on Facebook and Pinterest, which captures the attention of lots of admiring fans. Then they offer professional tips on things like gorgeous gel pens versus Prismacolor, or how to make that tricky flamingo in the corner of the page pop out at you. Suddenly adults are taught how much fun colouring can be. Plus, it helps them to reduce their high emotion levels, which means everyone is happy and colourful. From stags to owls, and badgers to birds, some of the UK’s most beautiful creatures have been captured in all their natural beauty, with some intricate touches of colour needed to bring them alive in your hands. Flicking through the untouched pages, I’m feeling super excited as the book is asking me to interact with it too. 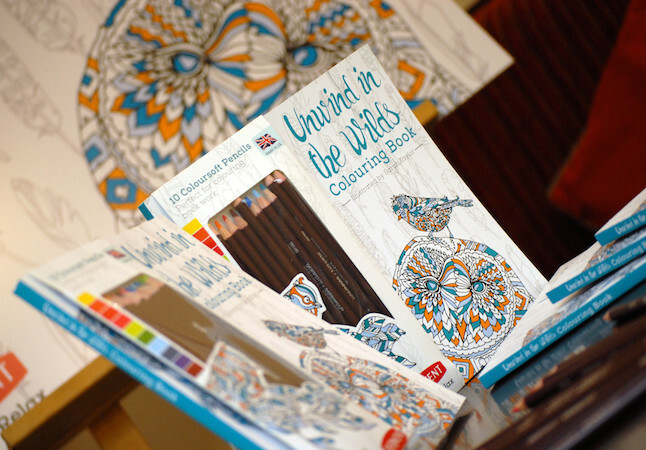 From drawing my own maze around the acorn stash, dressing an owl with my owl designs and adding feathers to a finch – ‘Unwind In The Wilds’ is an awesome colouring experience which really sparks your imagination. The high-quality, acid-free paper provides the perfect canvas for coloured pencils work and dry drawing media, such as Derwent Coloursoft pencils. If you need a little help, this book is on hand with handy tips too. 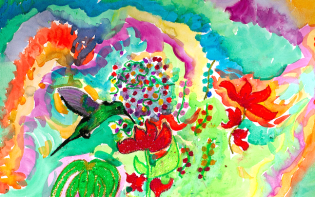 There’s advice about laying and blending colour as well as images of the illustrations that have already been completed so as to give the reader a spark of inspiration. I love this book and I’m delighted that children AND adults are now enjoying colouring together – dive into the rainbow and enjoy!